A large manufacturer of industrial woodworking machines has to service those machines at the customer site. Any machine failure results in lost production throughput and the expense of a technician traveling to the site. Using Vital, the customer's own technicians can don a pair of smart glasses and instantly be connected to experts at the manufacturer's headquarters, who can see exactly what the customer is seeing and guide them through diagnosis and repair. The customer's production line is back up and running rapidly, and the manufacturer can deploy their valuable expert team far more efficiently. Technicians assembling satellite circuit panels rely on complex instructions and constant inspections to ensure complete accuracy. With traditional paper and desktop instructions, the technicians must regularly move away from the work site to review instructions. Once each assembly step is completed, work pauses while an expert inspects and approves the work. Wearing smart glasses running Vital enables the technicians to review work instructions without downing tools or moving away from the work site. Inspections can be carried out instantly and remotely via virtual presence, allowing quality experts to be deployed far more efficiently. A commercial HVAC servicing company depends on its network of junior technicians to provide on-site support to its customers. The junior technicians often lack the experience to carry out more complex repairs, and an expert must be sent instead. Experts are a scarce resource and often located far from the customer site. With Vital, junior technicians can instantly have a remote expert looking over their shoulder and pushing diagrams to them, to guide and train them through a diagnosis and repair. First-time fix rates and customer satisfaction are significantly higher, and travel time and costs greatly reduced. Leverage your enterprise's existing hardware investments. Vital works with smart glasses from ODG, RealWear, Epson and Google, as well as on tablets, phones, laptops and desktops running Android, Windows, OSX or iOS. Strong data encryption, authentication, and support for the AirWatch and Augmate EMM/MDM solutions enable confident deployment into information-sensitive environments. We work closely with your IT team to ensure policy compliance, and can even deliver an on-premise solution. Vital knows Industrial IoT. We partner with our customers to integrate with existing infrastructure and custom data sources via our APIs. We're hands-on experts, offering broad professional services from content creation to pilot project design and execution, to drive your rollout to success. 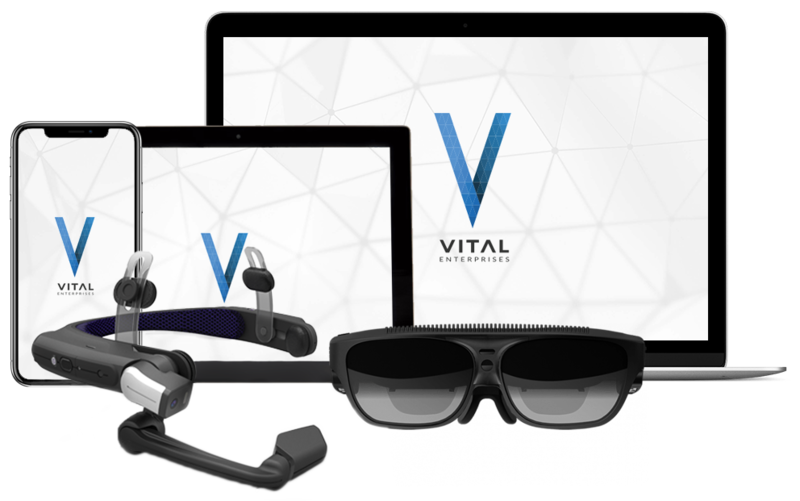 Vital is flexible enough to suit every business from SMBs to Fortune 500s, offering several pricing tiers, monthly or annual subscriptions, and the choice to buy smart glasses up front, lease with your monthly subscription, or simply use your existing mobile devices. Prices shown are billed annually. Billed month-to-month, Team is $90 per user and Enterprise is $175 per user. &ast; Only with an annual subscription. Smart glasses choices are ODG R-7, RealWear HMT-1, Epson Moverio 350 or Google Glass Enterprise.